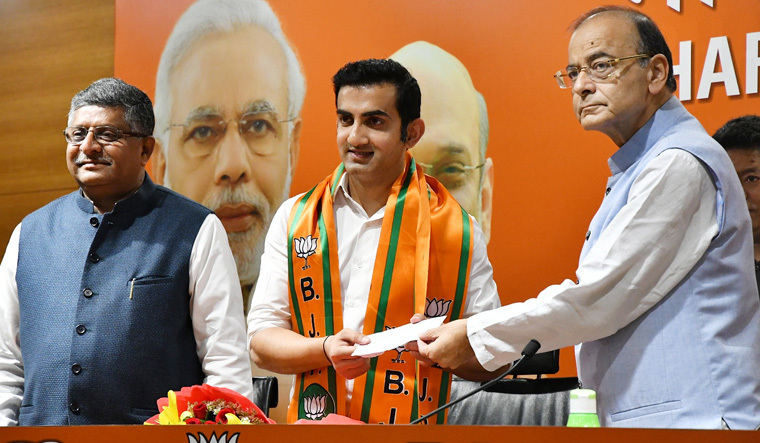 NEW DELHI: Former cricketer Gautam Gambhir joined the BJP today, just days before the national election and with several candidates still to be announced, ending months of speculation. “It is a significant induction,” said Arun Jaitley, one of the two union ministers who addressed a press conference to make the announcement. “I have been influenced by the PM, his vision for the country. This is a fabulous platform for me to do something for the country,” Gautam Gambhir, 37, said. The former cricketer may contest the April-May national election as a BJP candidate from Delhi. The 37-year-old may contest from the prestigious New Delhi constituency currently held by the party’s Meenakshi Lekhi, sources have said. He is a resident of Delhi’s Rajinder Nagar, which falls within the constituency. Arun Jaitley refused to confirm anything, said “Leave the decision to the party’s election committee”. Gautam Gambhir was recently awarded the Padmasri. He was a high-profile campaigner for Union Minister Arun Jaitley’s 2014 contest in Punjab’s Amritsar; Arun Jaitley lost the election to Congress’s Amarinder Singh, now Chief Minister of Punjab. The former India opening batsman retired from cricket in December after a 15-year stint. He runs a community kitchen, besides appearing as a commentator. His social media posts with strong comments on contemporary politics and incidents had inspired talk about his joining politics. His Twitter account is full of posts on the Pulwama terror attack, in which 40 soldiers were killed by a suicide bomber of the Pakistan-based Jaish-e-Mohammed.